Link to volunteer as a Helper. Link to Northern News article - 26 August 2015. 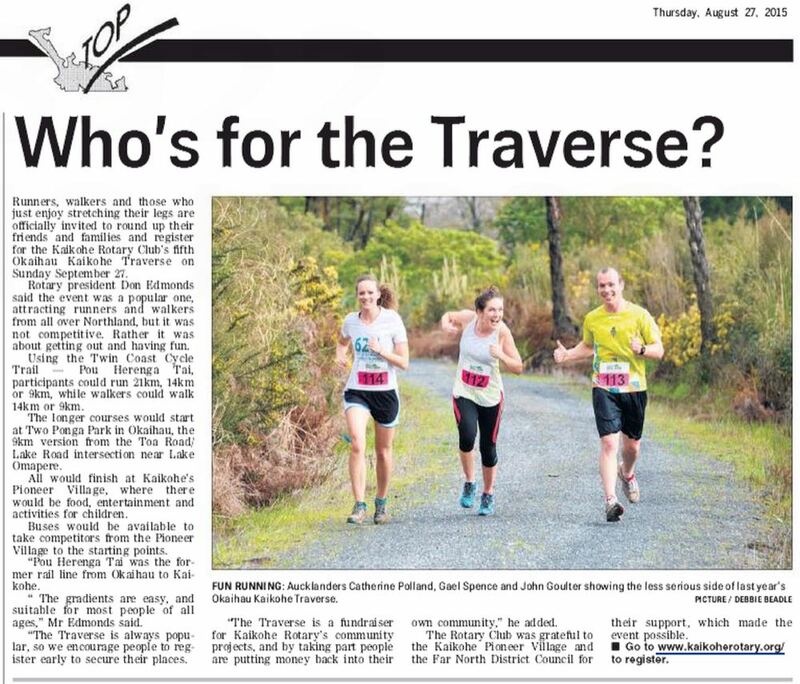 Link to Northland Age article - 27 August 2015. The Traverse Committee is meeting at Don’s at 5:30pm on Tuesday. Link to Rotary International Conference Flyer - Information about a travel package for the Seoul Conference - May 2016. Bay of Islands Vintage Railway - Fun Trivia Night - Saturday 19 September. We now have enough people to form a team of eight, but it would be good to have a reserve. Link to Wasrag (Water & Sanitation Rotarian Action Group) Blog. Link to Rotary Weekly - 28 August 2015. Link to Rotary Down Under - September 2015. Link to Rotary Service - August 2015. Link to the District Governor’s Newsletter - August 2015. Our team of Rotary Hoes took on all comers at the Daffodil Day Quiz at the Kaikohe RSA last week. We were doing nicely until the it came to a picture round where we were asked to provide names to 10 photos of artists who had no. 1 hits in 2014. This was too much for our team of refugees from the '60s and we only got two right. Nevertheless, it was a fantastic evening. Congratulations to the successful team from Westpac Bank and thanks to Cam Sutherland for a great job organising the event which raised money for the Cancer Society.